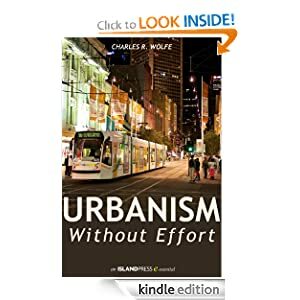 Charles R. Wolfe’s 2013 ebook Urbanism Without Effort: Reconnecting with First Principles of the City is interesting but ultimately empty. Wolfe, a Seattle land-use attorney, wrote this book to further the goal of successful urban development. He therefore presents his ideas about how to best plan a city. As far as I can tell, Wolfe believes urban planning will be successful only when the urban planner, or other interested person, first observes the context of the city that needs changing and then only applies ideas that will magnify what is already happening in the city. If that sounds confusing, I’m with you. One of the problems with the book is that Wolfe’s sometimes-convoluted writing makes it difficult to discover exactly what his ideas about the best way to plan a city are. However, even if Wolfe’s writing was clear, his thesis might not be, because another problem is that his urban planning proposals are vague and almost entirely theoretical. Further, one of Wolfe’s few practical ideas is that urban dwellers and planners should keep an “urban diary,” a record of what happens in your city, whether it be written, visual, videographic, or any other medium. This recommendation is cute, but completely unrealistic and, I think, unnecessary. I have lived in cities almost my entire life without an urban diary and have perceived and shared many experiences just fine. For instance, in the quest to define human relationships with the surrounding city, it is helpful to consider typical, everyday journeys within an urban environment. We usually begin every trip on foot, starting from a private place, such as a house or apartment. In order to reach the next place, we often use at least one other mode of transit. Meanwhile, others simultaneously travel in similar ways. Our paths cross and transit modes further diversify. If we stop and look around, we see a system of mutually crossed paths that define the urban experience. The public realm exists amid and between these paths – streets, sidewalks, squares, and parks that are subject to regulation addressing appropriate conduct, health, safety, and land use. This entry was posted in 4/6: worth reading, nonfiction and tagged book review, charles r. wolfe, nonfiction, urban planning, urbanism without effort, worth reading. I agree with you whole-heartedly. However, I don’t find that very helpful if I’m actually trying to find practical ways to better my city. It sounds like most of the other theory I’m going through in grad school right now…they all go on about the uniqueness of a place and that designers need to harness that by accessing their inner place-dar or whatever. This author might be suggesting the diary with the hopes that if you immerse yourself in the city long enough, its essence will osmosize into your brain or something. I haven’t read it though, so I don’t know for sure. The author actually sent me an email in response to my review. He clarified that the book was meant mainly as an inspiration.